Goodday Mica, mustard is surely the colour of the season and the good thing about is that it can be worn all year round. I love how you show cased the dress well with a bright and dark outerwear. Yes I was pleased it went well! OMG Mica, those are gorgeous ideas for different ways on putting on a dress! I love colorful pieces like those cardigans, because they can change drastically any outfit assemble only depending on the color and how you wear them (layered, short-sleeved, in different materials or knits...). Thank you so much for stopping by my blog and for your lovely comment. Super cute outfits as always. Love those colors together. Have a wonderful rest of your week! I like it. I think over a white button down shirt and over a turtleneck would look great too. Hi Mica! Beautiful portraits! ...definitely a statement dress and I adore how you accessorized it with the converse for a sporty chic and super cute look! Pray you have a great rest of the week! I love how dark-coloured dresses can totally transform when paired with a different bold, block colour. Both of these outfits look great on you!! This is a great casual dress and one that I would opt for and throw on! I like the way you have shown us two different ways to style it, I like the second look the best. That dress is so pretty and I love the pops of colour! Dresses like this are so versatile and who minds about paying full price when full price is only 15 bucks! What a steal! 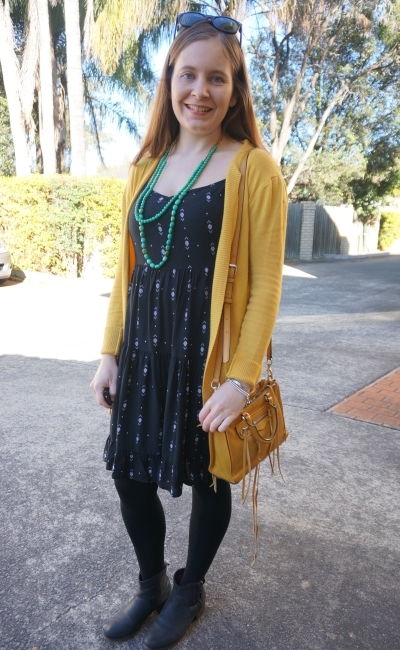 Love the dress paired with the mustard cardigan! Mustard and navy are going to be my fave colour combos this fall! I haven't tried navy and purple though and I love it on you! What a great dress! 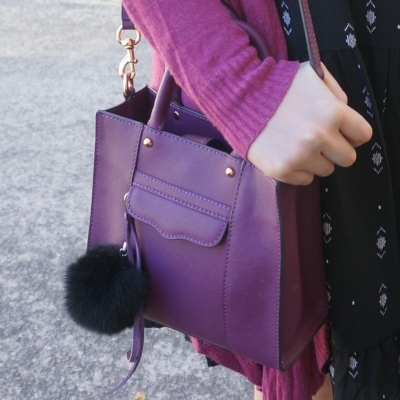 It pairs so well with bright colors too--I love it for both seasons. I'm glad Toddler T's first trip to the dentist went well! Such a great price on that dress! Very versatile and I'm sure you'll get a ton of use out of it. I love the mustard cardi with it! Great fall ish color for me! Such a gorgeous dress =, love that you can wear in many ways. That dress is so cute, and I love it with the marigold cardigan! Such a cute neutral dress - you could really do so many colours with it. I particularly like the mustard yellow. Nicely done, Mica! What a cute dress from Kmart! Congrats on completing your 6 months without shopping challenge! That's just awesome. What a lovely little dress! I love how you made it look so different with the different cardigans. I don't mind paying full price for items if I really want them, ther are only a few that I picked up after they had been reduced. Usually if I have waited that long I no longer want the things I picked. Saves a lot of money. Yes, it's good to wait it out sometimes! :) Better for the wallet, even if you end up not buying it, haha! 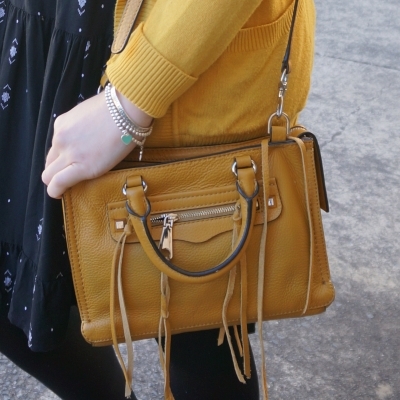 I love that mustard Rebecca Minkoff bag! Loving your outfits! Mustard is one of my favorite colors, I'm actually wearing a similar cardigan today! Hi Mica! You look lovely as always, and your new dress looks stunning on you! It was definitely a good buy and is sure to be versatile! I adore both looks, and the purple accessories really make the dress stand out. I must say that I like both ways. The cardigans make such a huge difference! Love the aztec print dress, it is perfect, easy and chic! 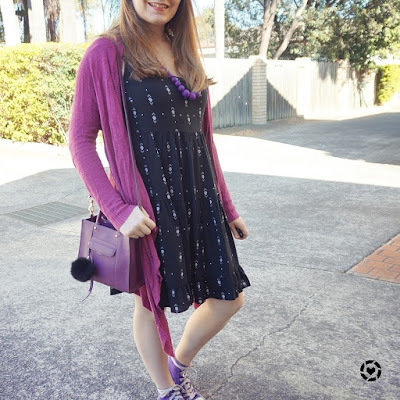 My favorite style was whit the plum cardi and lavender converse-like sneakers! Fabulous! Such a lovely dress on you! I love aztec prints! Perfect for summer. I usually rewear the same few things in my wardrobe over & over again but every time I visit your blog, I’m inspired to go through more of my things & switch it up a bit more! That is such a cute dress on you! Love the print and swish factor! The lavender converse are so fun! I was hoping to get a couple more coloured cardis this winter to do just this and get more wear out of my summer dresses but it didn't happen :( just have to keep my eye out! Yes, I'm planning on expanding my cardi collection next year too! Your cardigan looks pretty with your dress. I can't wait to get some cardigans to transition my dresses with! I love that dress Mica! What a great print and it looks fab with both the mustard and purple cardigan. This dress looks beautiful both ways, it's so versatile!